How to add SMS support for MS Teams? In this blog post we will go over how to SMS enable your Microsoft Teams account to send and receive SMS, and allow your customers to reply to messages for an interactive chat-like experience using Restcomm Cloud Platform. Microsoft Teams is a platform that combines workplace chat, meetings, notes and attachments. The service integrates with the company’s Office 365 subscription office productivity suite, including Microsoft Office and Skype, and features extensions that can integrate with none-Microsoft products. Restcomm is a CPaaS (Communication Platform as a Service) Enablement Platform running in the cloud, it provides a developer-friendly RESTful API (Application Programming Interface) and a no-code visual designer to build real-time Voice, Messaging applications in minutes! Open source software is at the heart of the Restcomm Cloud and it powers it using modern and well proven technologies to bring you the simplicity of the cloud and the confidence and freedom of open-source. The Restcomm team is really excited to bring the power of Restcomm CPaaS to the Microsoft Teams Community. Learn more about Restcomm here. The growing community of users on the Microsoft Team Platform are waiting patiently for SMS support in Microsoft Teams for years now, and the roadmap for 2019 does not seen to include the support for the SMS communication in MS Teams, which is stopping many users to have the confidence to migrate to Microsoft Teams. I have engaged with several users from the Microsoft Tech Community to learn more about their SMS use cases with Microsoft Teams and why is it that important for them. One interesting use case that caught my attention was a recruiting managers seeing their response rates go thru the roof when they use the SMS channel with their applicants, this example and many others prove how SMS is here to stay and grow and how consumers follow the best channel that helps them reach their target efficiently. Restcomm SMS connector for MS Teams is only the start for enabling you to have a complete real-time communication experience on Microsoft Teams. The Restcomm connector lets you engage more quickly and much more effectively with your mobile customers and workforce- and in the way they want to be contacted, simply using SMS. 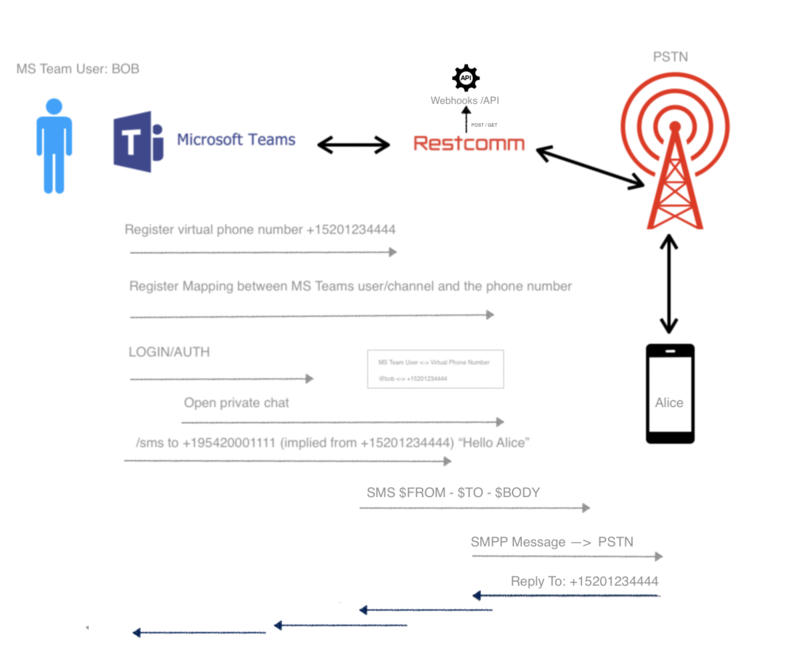 The below diagram shows Bob a MS Team user that wants to send SMS messages to Alice on her cellphone, First Bob will login to MS Teams and and install Restcomm SMS for MS Teams app to his work space, Bob is prompted to enter his login information to authenticate with Restcomm Cloud Account. Bob will then select one of the available phone numbers from the drop down list to activate and map it to his MS Team User/Channel, once that’s done Bob can use the /sms command to send a message from Microsoft Teams chat window to Alice’s phone number. Now when Alice receives a text message from Bobs virtual number she can reply to it and the message will instantly appear in Bobs MS teams chat window. It is worth noting that the message is passing through Restcomm Cloud infrastructure which means bob can call an external service (API – Webhook) every time a message sent or received. This can be extremely useful to update any third-party system with the conversation log automatically. You can view and contribute to the Restcomm MS Teams SMS connector source code on this GitHub repository. If you are an existing or new Microsoft Teams user excited about enabling two-way SMS channel for communications with your customers and workforce, fill the form below to join in our Early Access program, we would like to hear from you.